It is difficult to picture the frail, diminutive figure on top of the highest peaks of the world, as Junko Tabei enters the audience-packed CIRDAP hall, waiting eagerly to meet the first woman who reached the Everest. Thirty-eight years ago, on May 16 at 12:35 pm, 35-year-old Tabei reached the 8,763-metres South Summit of Mount Everest, with her guide Sherpa Ang Tshering and proved to the world that women too can reach for the clouds. Born in 1939, in the mountainous Fukoshima prefecture of Japan, in the Post World War conservative society, it was difficult for Tabei to pursue mountaineering as a hobby. Women were expected to do housework and an adventurous sport like mountaineering was not considered a woman's cup of tea. Nevertheless, this is the very mindset that nature-lover Tabei wanted to break. Thus at age 10, she climbed the 1916.9 metres volcanic Mt Nasu of Japan. As soon as the news of the conquest of Mt Everest by Sir Edmund Hillary and Sherpa Tenzing reached the 14-year-old Tabei, she began to dream of reaching the summit herself. By the time she was 21, she started working towards the realisation of her dream. Her chance came after completing graduation in English and American literature in 1962. She took a job that gave her the opportunity to participate in adventurous activities which included forest and mountain trekking all over Japan. For about eight years, she had to take these trips almost every week, gathering experience and inspiration to pursue her passion for mountain climbing. 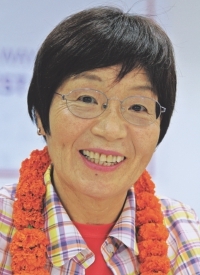 In 1969, she founded the Ladies Climbing Club: Japan to encourage Japanese women towards this sport. “I wanted to climb a 7000 metres mountain, but in Japan the highest peak was 3776 metre. So I had to start with that,” she says, “We came to know there are 14 mountains around the world with a peak higher than 8000 metres.” She and her 15- member team, who wanted to go for an all-women expedition to the Himalayas, gaged that once they cros the 8000 metres mark, climbing the rest would not be so difficult. So they decided to aim for the Everest. Tabei first wanted to climb the Everest from China, but failed to get permission from the Chinese government. So she was compelled to use the route from Nepal. At that time, the Nepalese government gave permission to only one group per season per route. As a result, when Tabei and her group applied for permission to the Nepalese government, there were already too many applications from other climbers awaiting approval. After one and half years, she received permission to climb the Everest in 1975. “My daughter was three when I went to climb the Everest,” she says adding how her husband Tabei Masanobu gave her moral support all through the expedition by looking after her young daughter. “Throughout the 400 days that passed between the applications for permission to the actual expedition, my husband was always on my side, giving me advice and moral support every step of the way. He has a lot of contribution in this,” Tabei expresses her gratitude. It was very difficult for Tabei to obtain sponsorship for the expedition. She says, 40 years ago, 90 percent men in Japan held traditionalist views that mountain climbing was not for women. Except for her husband and her elder sister, Tabei recalls how everyone else discouraged her. Her family members and friends worried what would happen to her home and kids, if she went out on such a long and dangerous venture. “I needed mental support more than financial help and I did not get this from anyone, before going out on such a big expedition,” she remembers. It had taken Tabei two months to reach the summit from her base camp. She even met with a life threatening experience when an avalanche struck her team's camp at 6,300 metres. Tabei, her team and the guides were all buried under snow and she lost consciousness for about six minutes before her guide dug her out. Still they decided to go along with the expedition as there weren't any casualties. To Tabei, the moment at the top of the world still seems like it happened yesterday. “My first feeling was, 'I do not have to climb any higher. I have reached the top',” she says with a chuckle. Tabei is also the first woman to have completed the seven summits, the highest peaks of each of the seven continents, in 1992. Yet, brushing aside all official barriers Junko Tabei climbed the Keokradong (reportedly the highest peak of Bangladesh) on December 28 and Bangladesh became the 61th nation in her list of conquests. Climbing the Bangladeshi peak was not a challenge for Tabei, she admits with a smile. “It is my hobby that I will climb the highest peak of any country I visit,” she informs through her interpreter. The programme where Junko Tabei met aspiring mountaineers of Bangladesh from Musa Ibrahim's Everest Academy was organised jointly by The Bangladesh Monitor, a travel weekly and Bengal Tours Ltd. Ibrahim, the first Bangladeshi to conquer the Everest, thanked Tabei for her inspiration recalling how in his childhood he memorised Tabei's name as the first woman to reach the top of the world.